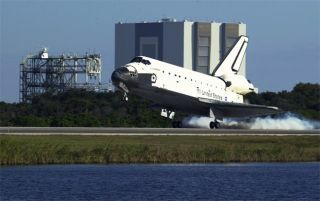 The NASA action is being spurred inanticipation of the closure of space shuttle operations in 2010. Moreover, thespace agency is keen on opening its doors to help the blossoming commercialspace flight industry. The SLF is a single, 15,000-footconcrete runway located in Complex 39 at the Kennedy Space Center (KSC). It isoriented to the southeast and northwest with runways designated as 15 and 33 onthe approach compass. Air traffic control is managed by a Military Radar Unitfrom a newly constructed control tower built to Federal Aviation Administrationstandards. NASA officials have indicatedwillingness to consider improvements to the SLF, but at user's expense. Spaceagency use of the landing facility would continue to take precedence over anyand all other prospective uses throughout the remaining operational life of thespace shuttle program and beyond. Research and technology demonstration flights of piloted and unpiloted aircraft and spaceflight vehicles conducted by other NASA organizations, other government agencies, their contractors, universities, and commercial manufacturers or operators. Parabolic research and demonstration flights supporting microgravity experiments and microgravity flights serving as a precursor to commercial human space flight. Commercial space flight research, technology demonstration, and logistical support, including but not limited to delivery of commercial spacecraft and flight hardware, captive test flights, and aircraft-based deployment of piloted and unpiloted suborbital and orbital launchers and spacecraft. Other research and technology demonstrations or experiments that can benefit from the characteristics of the Shuttle Landing Facility and KSC. the agency's requirements for support and mission aircraft and spacecraft thatmay require use of the SLF," a NASA request for information notes. "Accordingly, NASA does not expectto relinquish control or ownership of the SLF at any time in the foreseeablefuture. The agency may, however, explore the potential for out-leasing the SLFto an airfield operator at some future point to increase the efficiency of its operationfor the benefit of an expanded set of users. NASA does not intend to pursuethat option for the immediate near term but wishes to alert potential usersthat it may in the future," the NASA document adds. Under consideration by NASA isholding a workshop at the Kennedy Space Center,to further flesh out ideas for using the Shuttle Landing Facility. "This initiative to identifypotential non-NASA uses for the Shuttle Landing Facility responds tothe U.S. Space Transportation Policy issued early this year and thePresident's Management Agenda," said James Ball, NASA Spaceport DevelopmentManager at the Kennedy Space Center. Also, the U.S. Congress hasexpressed interest that NASA "be supportive of the emerging commercial spaceflight industry and good managers of our institutional resources," Ball told SPACE.com. "It's a good example of where we aregoing...to look for opportunities to expand access to our property and facilitiesbeyond NASA's own program requirements in ways that are compatible withour agency mission and roles," Ball said. "While we must not compromise ourcapacity to fully support the nation's vision for space exploration, there willbe opportunities, like we hope to develop with the SLF, for enablingaccess to KSC capabilities by users from all sectors," Ballconcluded.